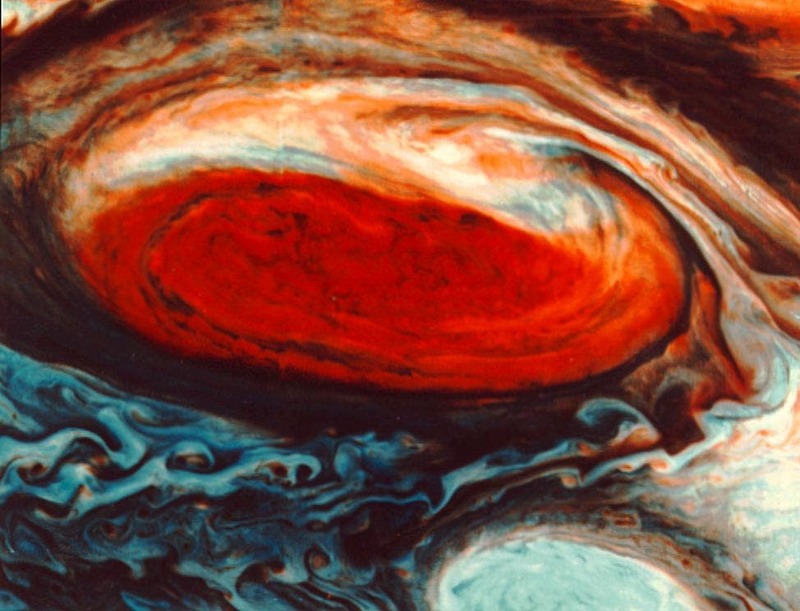 Astronomers at the University of Toronto have observed extreme brightness changes on a nearby brown dwarf that may indicate a storm grander than any seen yet on a planet, including Jupiter's 300-year old storm, the Great Red Spot (image above from Voyager 1). This finding could new shed light on the atmospheres and weather on extra-solar planets. Because old brown dwarfs and giant planets have similar atmospheres, this finding could shed new light on weather phenomena of extra-solar planets. As part of a large survey of nearby brown dwarfs – objects that occupy the mass gap between dwarf stars and giant planets – the scientists used an infrared camera on the 2.5m telescope at Las Campanas Observatory in Chile. In that short time span, they recorded the largest variations in brightness ever seen on a cool brown dwarf. "We found that our target's brightness changed by a whopping 30 per cent in just under eight hours," said PhD candidate Jacqueline Radigan, lead author of a paper to be presented this week at the Extreme Solar Systems II conference in Jackson Hole, Wyoming and submitted to the Astrophysical Journal. "The best explanation is that brighter and darker patches of its atmosphere are coming into our view as the brown dwarf spins on its axis," said Radigan. "We might be looking at a gigantic storm raging on this brown dwarf, perhaps a grander version of the Great Red Spot on Jupiter in our own solar system, or we may be seeing the hotter, deeper layers of its atmosphere through big holes in the cloud deck," said co-author Professor Ray Jayawardhana, Canada Research Chair in Observational Astrophysics at the University of Toronto. According to theoretical models, clouds form in brown dwarf and giant planet atmospheres when tiny dust grains made of silicates and metals condense. The depth and profile of 2MASS 2139's brightness variations changed over weeks and months, suggesting that cloud patterns in its atmosphere are evolving with time. "Measuring how quickly cloud features change in brown dwarf atmospheres may allow us to infer atmospheric wind speeds eventually and teach us about how winds are generated in brown dwarf and planetary atmospheres," Radigan added. The Daily Galaxy via University of Toronto.